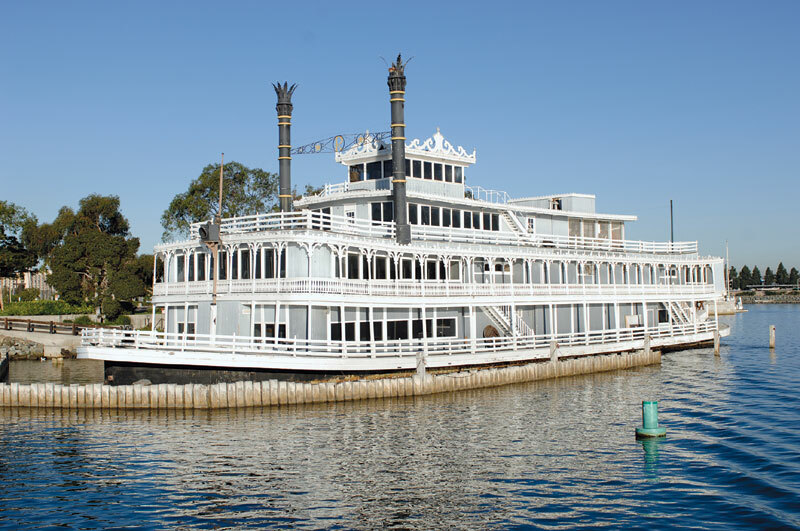 SAN DIEGO — A floating restaurant that was modeled to resemble a turn-of-the-century paddlewheeler has been removed from the east end of San Diego Bay’s Harbor Island. The landmark was towed from its 43-year location on April 24, for an assessment of its condition. The former restaurant, known as Reuben E. Lee, was constructed in 1969, but it has not been in use since it was deemed structurally unsafe in 2003. Cohn Restaurant Group, which owns the Island Prime and C Level restaurants next door to Reuben E. Lee, has been working on plans for a complete overhaul of the New Orleans-style riverboat since 2008. At that time, the plan called for a $9 million renovation that would include completely remodeling the boat into more of an open-air patio area, to be used for events and banquets. But with the boat in disrepair, the future use of Reuben E. Lee in any capacity at its old location remains in question. “Right now, no decision has been made for the boat, because we don’t know if it is salvageable or not,” said Tom Story, vice president of development at Sunroad Enterprises, which is the leaseholder. Story said the vessel has been towed to R.E. Staite Engineering’s boatyard, where an assessment of the structure is under way. If the vessel’s integrity checks out, the superstructure of the vessel will be removed, making way for an events area to be used in conjunction with an additional landside restaurant that has been approved for the area by the Port of San Diego. David Cohn, president of Cohn Restaurant Group, said the company plans to release more information on its plans for the location, once the overall condition of Reuben E. Lee is determined. Currently, Cohn Restaurant Group has 16 locations, with 12 in the San Diego area.